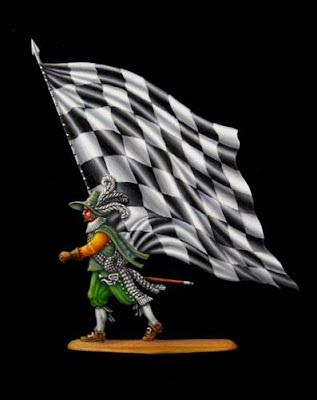 Swedish banner painted by Franzoia Serge. Observe the excellent black and white checked pattern of the flag. For the next five chapters I will deal with various colors grouped in categories. Let me say it from the start. I am not a professional artist nor I have finished any art school. What will be presented here coming from personal observation, experiences and notions. Feel free to agree or disagree with it, accept the tips and use them for your painting or don’t accept them, make your own observations and go from there. For example someone can say, hey don’t shadow red by using alizarin crimson. Why not? If the shadowing made by it pleases me then by all means I will use it. I have shadowed red with darker red, brown, green, crimson, even blue. And I ask again, why not? In the end, we are amateur painters that like to experiment and try new things and if the end result is what we were looking for, then we are allowed to use whatever irrespective of rules. Before we begin discussing about the various colors lets clear some words using the following table. The specific character of a colour, e.g. an orange-red or a green-blue, its position on the colour wheel. How dark or light a colour is, from 0 to 10, black to white. Cadmium Red Medium is typically about value 5. How intense (bright or dull) a colour is, for example Cobalt Blue is high in chroma, Chromium Oxide Green is low in chroma. A colour that cannot be mixed from other colours, e.g. red, yellow and blue. A colour mixed from two primaries, e.g. orange, green and violet. The colour opposite to another on the colour wheel, e.g. red and green, yellow and violet, blue and orange. To dull down, to lower the chroma of a colour, usually by adding its complement. The leaning of a colour towards another, e.g. a green-yellow or an orange-yellow. Let’s start with black. When you want something painted in black color, simply don’t use black. Instead either mix some blue with ivory black for a cooler shade or flesh for a warmer shade. Adding some brown, red, violet or green will tint the black color slightly giving our blacks a greater variety. Add some titanium white to lighten the black a bit. In reality you will have made a gray but in our eyes still be black. Now add shadows with pure black, lamp black preferred and highlight with turquoise or flesh depending on if you want cool or warm temperature and minor quantities of white. Don’t exaggerate the highlights though. Blend as well as you can for subtle transitions between shadows and lights. Look at different painted figures and you will notice after careful observation that no straight black is used anywhere. Instead different shades of dark gray, with the appropriate shadows and lights create the effect of a black surface even if its not. Otherwise if you start straight with black, there won’t be any color for shadows. Ivory black is a color that can be used to darken other colors without overwhelming them. 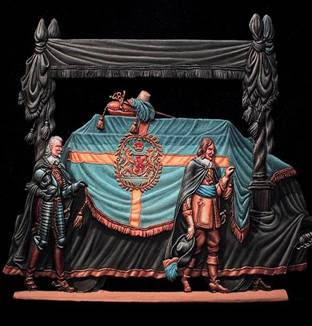 Composite figure from Mohr’s set “Funeral of Gustavous Adolfus” painted by Greg Di Franco. Lots of black clothing but nothing too difficult if you don’t start with straight black. Same story is white color but from the opposite side. If you start with pure white, there won’t be any color for the highlights. Instead make different combinations of white adding nearly any color you like. Ochres and browns will create a tan-white, warm in color shadowed with more brown and highlighted with straight white. Red, green, purple or blue can be used for spectacular variety for your whites. Blue and green will give a cool temperature to your white. What is very challenging to make and interesting to observe after, is when different shades of white or black are side by side like a figure wearing a white tunic, with a white sash and white trousers. 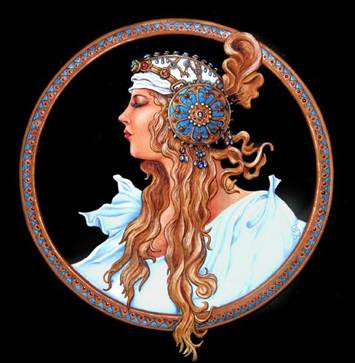 A bust of an unknown artist from a Detlef Belasch creation. Observe the cold temperature of the white shirt. Instead of gray black boring shadows, some shade of blue has been used. If you make 3 different mixes of white with 3 different hues added, your end result will have all 3 surfaces white but each will look different from the other. Titanium white is the most used white, opaque all purpose white that you will use it in nearly every color mixture you make. Flake white is a transparent white, useful for white glazes. Zinc white is rather rare lately because of its zinc component which is poisonous. 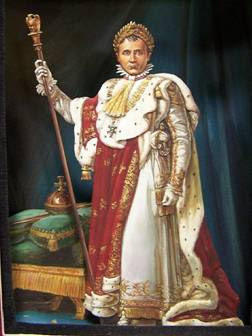 An amazingly painted Napoleon in coronation robes by Greg Di Franco. Here shades of ochre have been used for shadowing, Compare with previous photo. Also observe how direction light is implicated by the careful painting. As with every other color, use the amount of shadows and highlights you feel happy with them. Don’t consider that a black item has less and a white has more. They can have as many as we want them to have. Just be patient when you paint and don’t rush for finish. Black and white will be also discussed in the chapter about painting metals since they can be used to implicate a metal surface by careful shadows and lights. Although I don’t own any gray oil tubes, only exception is Payne’s gray. It’s a dark gray, rather transparent color than can be used as a shortcut when we need a gray fast and it’s perfect for white metal simulation but more about this later.